I’ve just taken delivery of the foodie’s equivalent of a new BMW i8. Last week I committed to a joint venture with The Explorer Club Africa in The Elephant Café, a new restaurant built on a deck in the Zambezi River, set among a resident herd of orphaned and rescued elephants. It’s small, it’s gorgeous, it’s eco-friendly, and it’s the type of vehicle I could only have dreamt of to showcase the recipes I’ve been developing with wild edibles and local, seasonal ingredients here in Livingstone. The Elephant Café will become the center point of a riverside location that’s been home to a herd of hand-reared elephants for many years. They are elephants that were rescued from drought and culls decades ago; elephants that later assimilated from the wild; elephants that were born into the herd. They are elephants that have grown up with safe human support using the “positive reinforcement method.” Being around them in close vicinity, discerning the rumble of their songs from deep within — sensing their wildness and enormity — touches something primal and very old within you. The restaurant sits twenty-four guests. Opening is scheduled for June, 2016, and pre-booking will be essential. Guests have the option of arriving at the restaurant via jet boat from destinations further down river. Guests will have the privilege of interacting with the elephants, and watching them as they dine. Over time we will offer fine dining experiences through the day, beginning with a sunrise excursion and a three-course lunch. The food will be prepared using fresh local ingredients, with a strong focus on wild edibles, thus the menus will change with the seasons. So many of the ingredients I forage from the wild are also much loved by elephants: mongongo nuts, marulas, wild sourplums, baobab and muchingachinga fruit. I’ll be developing more and more recipes with these wild edibles as we move along. It’s a productive time of year right now. Ripe marulas are dropping from the trees, as are the mongongo nuts. Word is out that I’ll compensate the community if they assist me in foraging for wild ingredients. As a result I’m now in possession of over 100kgs of mongongo nuts; nuts that I use in biscotti, salads, and to make mayonnaise, among other things. On Monday I’ll drive down to the women in Komanyana Village beside the Zambezi River, who’ve long been taught how to crack open this notoriously hard nut. It is my sincere hope that by promoting the use of these diverse, and largely unexplored, natural resources, our surrounding communities will be enriched as well. The Elephant Café sits in a place that is not only breathtaking, it’s imbued with an energy of interconnectedness and calm. It’s a place that invites in other wild animals like giraffe, wildebeest, zebra, and antelope from the surrounding Mosi-a-Tunya National Park. It’s a place that’s alive with bush-speak, from the throats of the river birds, from luxuriating hippos, from squabbling monkeys and baboons in the canopy overhead. It’s a place that carries the spirit of the elephant. Being asked to be a part of it is a gift that has uplifted my confidence, flooded my imagination, and fulfilled a dream of feeding people in a way that’s unforgettable. For this I feel immense gratitude. Photo credits: Sean Edington. With grateful thanks. Well done. I feel sure you will be very successful. Lots of luck in your new venture. Sounds wonderful. Sounds very exciting Annabel – congratulations. I love the pictures of you with the elephants! And the cafe looks beautiful. Much gratitude, dear Margie. It IS so exciting, and I feel so fortunate to be given this opportunity. Wonderfully exciting for you Annabel! Hey Annabel this looks exciting and rather wonderful. Best wishes with the project and please let us know when it’s open. I will, of course, Charmaine. Thank you for you kind comment. I look forward to feeding you and your guests! How incredibly, wonderfully exciting, Annabel. They are lucky to have you on the team! Enjoy and keep us posted. Much love! Thank you, kind Jen. It is indeed incredibly, wonderfully exciting! Wonderful! Well done it looks fabulous. Hope to visit sometime. Thank you for your kind comment. I hope you visit, too! Annabel, I have tears in my eyes as I read this! Watching this path unfurl before you brings me absolute joy. I don’t think this could be any better. 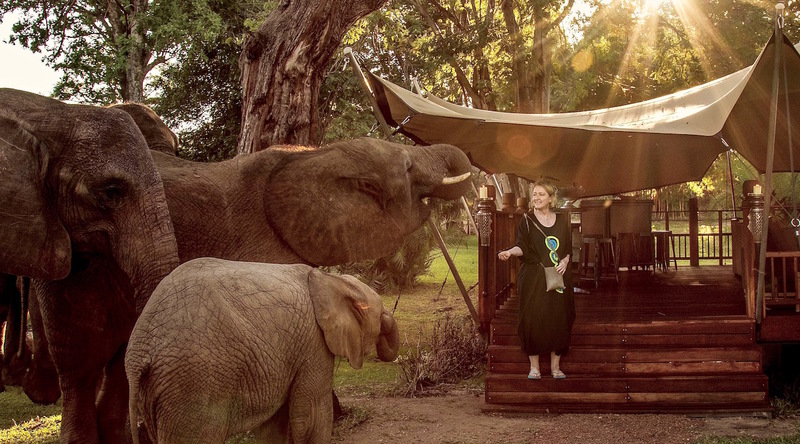 The setting is exquisite, the elephants incredible, the symbiosis with the local people…the thing that makes it all perfect. Incredible Annabel! Must be so fulfilling for you. Huge well done for reaching this ‘space’ you’re in right now. What a lovely comment, Cherie … thank you. I really do feel hugely blessed. Wow, how truly amazing….wishing you all the very best in this new venture! Bravo! And what great pics. Much gratitude, Michelle. Come and visit! Indescribably wonderful! The bestest of luck and enjoyment of all the hard work this will entail – but oh, so much pleasure I am certain! Wish I was there with the heffalumps [my younger daughter’s babytalk!] listening to bushspeak! It is such a lovely place, Eha. Thank you for your kind comment, as always! What a wonderful (ad)venture! All the very best , I’m sure it will be incredibly successful. Thank you, Shaunagh. I so hope you’ll come and visit one day with your delightful family! Incredible.. So deserved … Your trust and commitment rewarded by the benevolence of interconnectness of all things. You are exactly where you are meant to be and we are all so lucky to be a part of the journey through you. I look forward to the unfolding of this rich adventure one step at a time as you inspire so many to take a step on their particular adventures alongside … Very exciting ??? Would be a dream come true .. I fancy you would whip up some pretty extraordinary vego options … One day , maybe one day? For there are many yet to come ? Annabel, what an amazing update! Congratulations on your latest and greatest adventure. My mom, in Oregon, is keeping up with your blog as well and sends her best wishes. She would probably be on a plane to visit your restaurant soon if she could? So exciting for you, best of luck with all your plans. Thank you very much, Lucy! Your kind comment came as a great surprise. It’s been decades since we were last in touch. I hope this finds you well and happy! Congratulations Annabel, this has got to go on my list to visit, can’t wait. Thanks so much, Jacqui. Let me know if and when! Simply amazing–both the restaurant and you. I always leave your site with renewed confidence in humanity. Best of luck and, it surely goes without saying, enjoy the ride. You did it! You’ve realised your dream! How truly exciting Annabel…. we’ll be watching your space with huge interest as know it will be a wonderful labour of love with success to follow. Huge congrats! Lovely to hear from you, David … and so much gratitude for your super-kind comment. By all accounts, it looks like you’re realizing your dream in Botswana, too, which is just wonderful! I’ve so enjoyed reading all the praise for Ride Botswana. Congratulations, too, on the awards you’ve been winning. So well-deserved. All that hard work is really paying off! Yes, Meagan … and thank you for seeing it! What an amazing adventure. All your hard work is paying off. Can’t wait to come and try it one day. Well done. What is the name of the project that hand-rears these elephants? Where is this restaurant located? Most interesting concept and did not know there were any other elephant orphan projects in Zambia besides the GRI Lilayi/Kafue operation. Annabel, You have brought to life a part of the Zambezi we didn’t know before but all of us are now with you on your journey. Thank you my dear Bella with your enthusiasm it can,only go well. Dearest Tish … I am so grateful for your sweet note and, of course, for your support and interest. Thank you. I am so lucky to be here, living this life with the lovely Chris in a place that is magical. Truly you are a dazzling inspiration. I adore following your amazing journey, and so delight in your words of smooth elegant with humor of sharing and visuals to die for, bravo!!! Best to you and Chris, enjoy your travels. Oh I’m so excited for you and this lovely venture! That would be a dream come true dining experience for me, but I’m not sure if we’ll ever get back to Africa. We spent an incredible three weeks in Tanzania and Rwanda 7 years ago, and I so want to return to visit other countries, but there are also so many other places on our travel list. Kiss an elephant for me!!! Thank you so much for your kind comment, chef mimi. It is indeed a dream come true. I start full-time tomorrow … and will pass on your kiss to an ele! They are beautiful.